After a lengthy conversation with a new acquaintance about fast fashion (and the fact that 'slow fashion' as a term for the alternative was less than desirable) I decided that further elaboration on wardrobe editing I mentioned in a previous post was in order. I am certainly not the only one who feels this way (take Project 333, The Good Closet, or Transparent Seams, for example). Fashion as we know it is about consumption. What was at first an industry designed to meet a vital need (we humans seem to need food, shelter, and, of course, clothing) soon became a rapidly multiplying circus of disposable goods, manipulative marketing, and excess-as-success. On the one hand, we live in an area that promotes and distributes countless aesthetic choices. One can articulate their visual representation in endless ways. One is not limited to a dictated national dress, nor is it any longer the case that 'fashionable' items are beyond the financial range of most Americans. On the other hand, the vast options for dress came at a price. Our cultural upbringing developed in us a hunger for the new and a taste for acquisition of good as a way of feeling accomplished. Being fashionable shifted from focus on class and creativity to accessibility, speed, and assimilation. There are multiple implications of this shift and I have and will continue to elaborate on pieces of it via this blog. My focus today is on the idea of a wardrobe detox. Open your closet, take a look around. Asses its contents. How often do you wear the things inside? Do you have things you have never worn? Does it suit your lifestyle? The most common comment I receive is that one simply has too many clothes. I propose a not just an evaluation and a little editing, but rather a Wardrobe Detox. Shed all unnecessary clothing. Donate it or recycle it into new pieces. Figure out which pieces are really important. Distill your clothing items into your unique style. 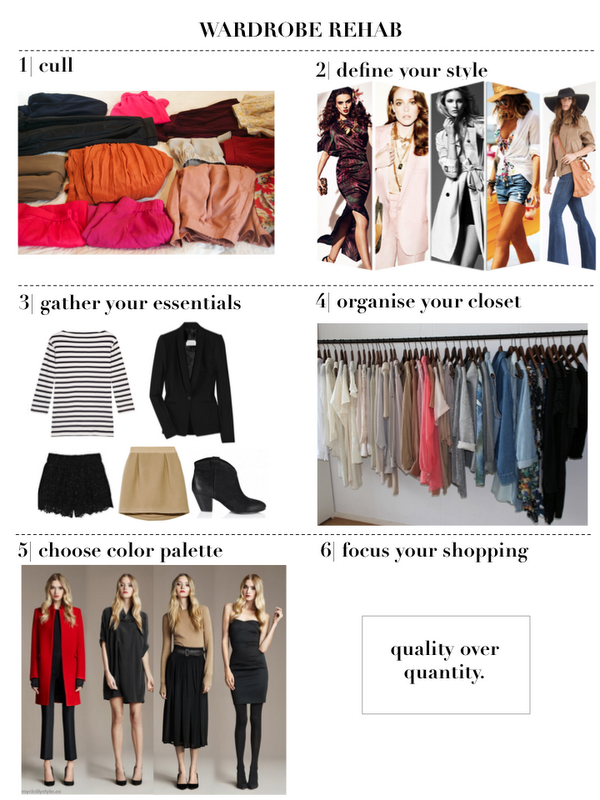 Once you have your bare bones wardrobe assembled, start filling in the gaps. Cheap, fashionable clothing from h&m, forever 21, and other places like them will be revealed for what they really are: Temporary, disposable items. Once you are down to your bare bones wardrobe, you'll realize how little you really need. Take all the money you would have spent on 15 new shirts to wear once and have a nice piece of clothing made or buy something from a fair trade or artisan empowering retailer. essential fashion investment fashion thoughtful fashion responsible fashion durational fashion utility fashion considered fashion staple fashion curated fashion planned fashion smart fashionI'll keep thinking of good titles for this paradigm shift. In the mean time, I plan to present a series of posts dedicated to Wardrobe Reconsideration, Rehab, and Detox.